Ah, August. That time in the year where studios basically dump their remaining films for the summer. Most of the time they're usually action and horror movies that got little to no publicity whatsoever. But often times this is where smaller productions (regardless of quality) get released. More often than not, some good titles go unnoticed. One such title is James C. Strouse's People Places Things. As is the case with most indie features, the film doesn't boast many big names. (Unless you've seen your fair share of cable TV.) But does that weaken the film's charm? Of course not. To give you an idea of what People Places Things is like, its mood is similar to that of Kramer vs. Kramer. 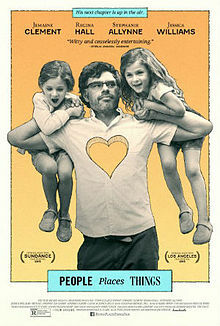 Both films revolve around men trying to cope with life as a single father with varying degrees of success. Yes, Kramer vs. Kramer is decidedly more serious in tone than People Places Things but the point still stands. What People Places Things also does is paint a portrait of life after a personal failure. You think life can't go on after losing someone dear to you but it's far from that. Sometimes all it takes for things to get back in order is a gentle nudge. Between a summer of blockbusters and awards season, it's nice to have something that's more of a breath of fresh air. It's an escape from the last few months of moviegoing fare, and it's something that one should seek out when you have the chance. It's a charming little film. Sometimes the reality subtext behind a work of fiction can show up within said fiction. Take for instance Roberto Rossellini's Stromboli. His first collaboration with actress (and future wife) Ingrid Bergman, it's a film about a woman in an unfamiliar land trying to stay intact mentally. If you're familiar with the behind the scenes scandal of the film, one can't help but wonder if reality began to imitate art. What was the scandal? Rossellini and Bergman, both married to other people, began an affair during production which resulted in Bergman getting pregnant. 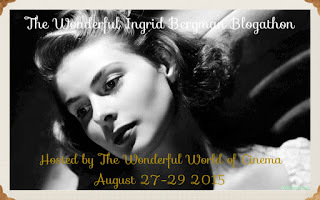 The world was shocked at Bergman's actions, which ended up tarnishing her career for most of the 1950s. (It was restored after she won an Oscar for Anastasia.) Because of the scandal Stromboli was ignored by audiences but decades later, it received the praise that the scandal clouded over. 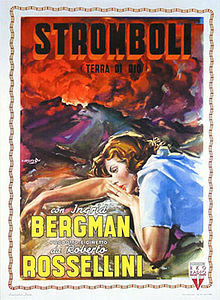 As you watch Bergman throughout Stromboli, you wonder whether the effects of the scandal began to affect her. Shortly after her character Karin arrives on the titular island, she complains to her husband that he's not able to support the lifestyle she's used to. Seeing as how Bergman was a prominent name in Hollywood at the time, it's likely it wasn't too much of a stretch for her to feel the same during both the production and her self-imposed exile. 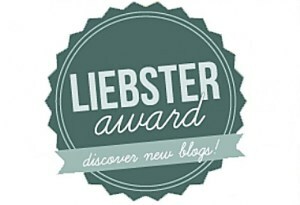 Spandan of Cinephilia has nominated me for a Liebster Award. As per the rules, I need to answer the 11 questions provided, pass it on to 11 other bloggers with 11 questions of my own. So let's get started, shall we? 1. Which is your favorite film of the 1970s? I have to choose just one? Ugh, fine. Um...probably Apocalypse Now Redux. 3. Which is your favorite Western? Rio Bravo, without a doubt. 5. Which is the first film you have seen in a theater? Not sure precisely, but I think I remember seeing Monsters, Inc. when it was in theaters. 6. Which are the five DVDs/Blu-rays in your personal movie collection which you will never give to anyone? Oh, that's easy. My Criterion copies of Sweet Smell of Success, Bigger Than Life, The Night of the Hunter, Shallow Grave and Ace in the Hole. 7. 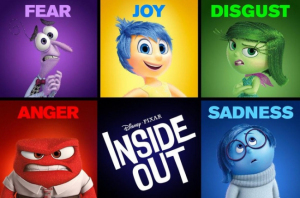 Which is your favorite animation film? I don't usually watch them, but WALL-E has a place in my heart. 8. Which movie star you'd love to go on a dinner with? Tom Hiddleston, hands down. 9. Which is your favorite movie soundtrack? Either The Fountain or A Single Man. 10. Which is a film that you will recommend that you think not many have seen? Oh Lord, there are a lot of movies that I'll recommend to people that are severely underrated. But to choose just one, probably Local Hero. 11. Who is you favorite film critic? Roger Ebert. Right, so who to pick, who to pick...oh! I think I got a few in mind. What's that one movie you always recommend to anyone who asks? You’re able to go back in time and be an extra on the set of any movie. Which one is it? Book version or movie version: which is better? Best performance from your favorite actor/actress? Watching movies alone or watching movies with someone? Blergh. Coming up with questions is hard. Thankfully I don't get tagged for these awards very often. 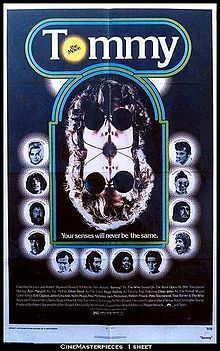 There must have been a few naysayers when it was first announced that the Who's rick opera Tommy was going to be made into a film. "How could anyone turn an album into a movie?" one might be asking, especially if it's an album as wild as Tommy. Simple: get someone who's more than capable of depicting such insanity. And who better for the job than Ken Russell? After all, this is someone where "low-key" and "self-control" don't exist among his personal vocabulary. (Just watch any of his films, and you'll see how true that is.) Quite frankly, no one but Russell could have made Tommy into a film. Pick one director and identify his or her first feature film. It must be the first feature film (i.e. over one hour runtime) listed in her/his filmography. While you will be primarily discussing that one film, you should have an understanding at least some of the director's later films, enough to be able to recognize his or her style. Analyze your chosen film in relation to the director's later projects. What elements of his or her style do you see here? Keep in mind that this blogathon is based on critical thinking and analysis, not simply on whether you liked the film. Your post should not be so much on the film itself as what it says about the director. Repeats (i.e. two people writing about the same director and film) are acceptable, but discouraged. If you do choose a topic someone else is writing about, try to find something different to say on the subject. Include a banner and a link back to this post. 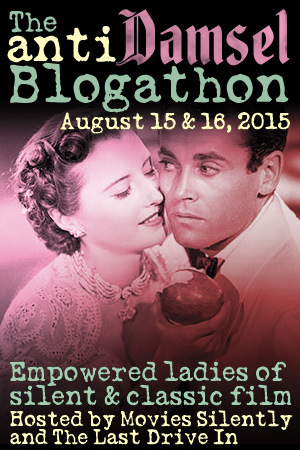 There are several banners to choose from below, and you are permitted to create your own provided they fit the blogathon's themes. My choices start after the jump. Can you believe that Defiant Success has now been running for six years? I didn't even think it would last this long but here we are. Sure, my own life has had its ups and downs recently but I do try to keep this blog alive.